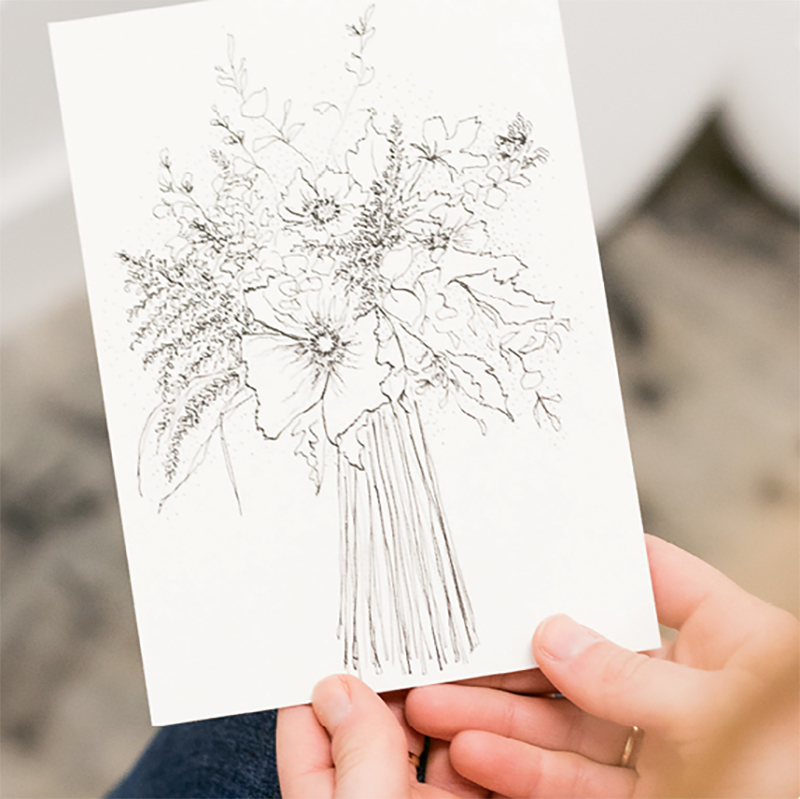 Weddings make us turn toward traditional customs, and that extends right down to how we address envelopes and write thank-you notes—typically by hand. And since good penmanship has slipped out of everyone’s standard skill set (thank you, texts and emails), fonts are made to look like pretty handwriting and professionals are called in when calligraphy is called for. Perhaps that’s why this trio of Charleston artists captured our attention so thoroughly. Each is a master with pen and ink (or in the case of one, digitized pen and screen), and each turns their talent toward creating mementos for brides and grooms. Take a peek at just a little of what they can craft to commemorate your Big Day. 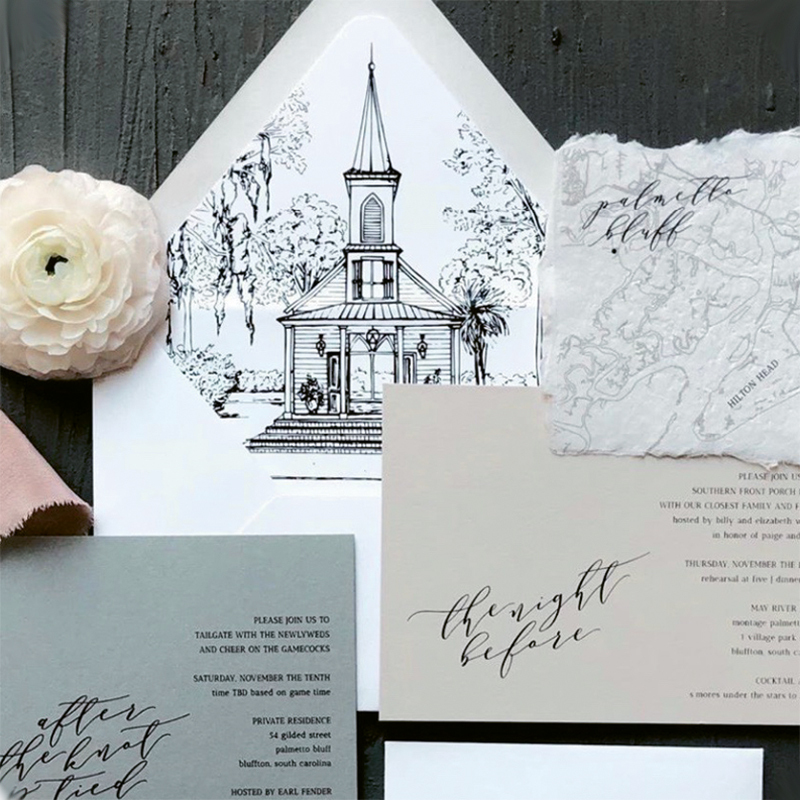 After moving to Charleston from Pittsburgh back in 2016, Kayla got into the wedding industry via her photography business (she’s got a Bachelor’s of Fine Arts in photography), and thus stumbled into a full-blown love for—and talent in—calligraphy. And while her menus, place cards, and invitations are stunners (above), we’re just as smitten with her exquisitely detailed bouquets. Kayla draws these creations with a digital pen so she can resize the artwork at will and so reproduction will be crisply rendered no matter the dimensions. Working in a digital medium also allows her to reproduce the bouquet in myriad forms. “There’s no real limit to what we can do,” she says. “We can overlay it on photos, we can add it to cards, we can set it as iPhone backgrounds—you name it, we can figure it out.” As for investment, prices start at $200 for the renderings, and delivery can take about three weeks. “This is a beautifully slow process,” she says. With her sketches, paintings, and paper collages, Louisiana-born Paige captures flowers in a minimalistic way akin to poetry—a smattering of her well-laid lines can create a full-blown bouquet. Based out of Redux Contemporary Art Center, her commissions have included bridal bouquet “portraits,” which she fashions after photos of the Big Day. “I want to learn what type of piece she has in mind,” says Paige of why she quizzes brides before starting a commission, “what medium we should work with to capture that, what size she is interested in, and where it will end up. I want the piece to be able to move with a couple as they transition through different homes.” Beyond keepsakes, Paige also transfers her work to cards or paper napkins, which make terrific thank-you notes and cocktail party fare. Her pieces start in the $50 range and can take anywhere from one to six weeks to complete. While Jenn’s impressionistic, colorful paintings of Lowcountry icons—oyster shells, Bill Murray, marsh views—make up the bulk of her subject matter, we’re highlighting her here for her cheery house and building portraits. The ebullient artist ventured into these pen and ink (and often watercolor) renderings via commissions, and her prowess at capturing place and vibe alike has made her a go-to for them. And like so many things in Charleston, her work has spilled over into the wedding world. Couples now hire her to sketch their chapels for invitation suites and paint their ceremonies in real time, too. (We’ve heard her likenesses of newlywed homes also make great Big Day gifts.) Illustrations and small paintings done in-studio begin at $400. Live paintings begin at $800. Custom work (she’s happy to create a fanciful version of your bouquet) is priced by project.